April was not a great month and May has not started well either. First, I was taken out by an extremely long Familial Mediterranean Fever attack. Next, a bad chest cold set in. I finally felt like I was going to be able to come up for air when some vicious enemy started releasing copious amounts of pollen and sent me back to bed. Everything in tandem has kept my Bipolar brain in full-throttle. On top of all of that, a freak storm passed through yesterday and snapped one of the biggest pines behind my house in two. That means I will have to brave the pollen to clean up my yard yet again. I’ve already lost a tree this year and lost two last year. It almost makes me want to cut them all down. Hello, dear readers. I am actually rather positive despite everything that has been working to keep me down. There is some frustration that I am not posting on this blog with the frequency I had hoped, but overall I know things are moving in the right direction. 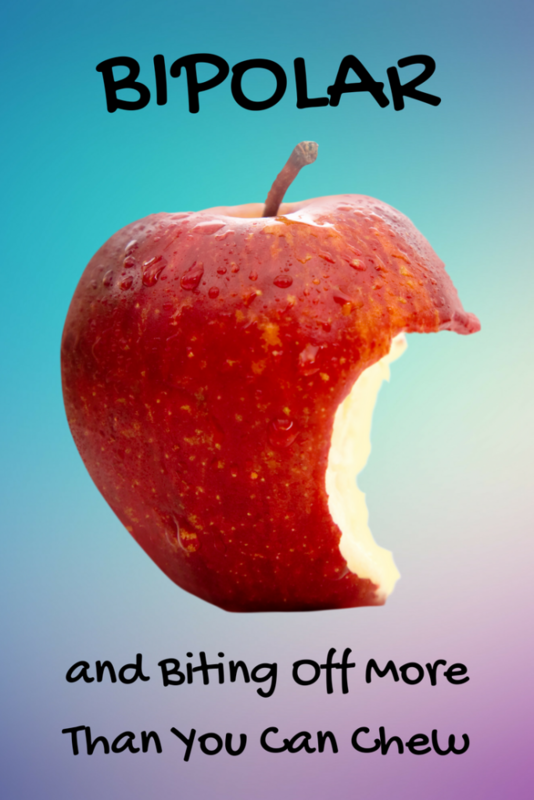 How big of a bite should you take? Regardless of our mental health status, most of us struggle from time to time from taking on more than we can handle. In January of this year, I left a stable job that had become untenable. Since then I have been freelancing as a virtual assistant and ghostwriter. I love working from home. In my panic to make sure enough money is coming in, I created relationships with several great companies. These companies have plenty of work available to keep me financially secure. The problem is developing, though, that there is not enough time in the week to properly feed all of these companies AND still care for a blog. This blog is a passion project of mine. I feel it is vitally important for men especially to start talking about mental illness, and chronic health conditions in general, so hopefully fewer men will continue to suffer in silence. That means this blog has to find a place of priority in my life. I’m struggling a bit with getting all the pieces to fit together, but I do believe that in time I will achieve success. So far, I am finding true satisfaction and joy in all of the companies I am currently contracting with. The logical, and frequently silenced, part of my brain knows that I have to reduce the number of companies I am working with to be of any real value to the remaining ones. But my Bipolar brain, which is always the louder tyrant, thinks that 24-hours in a day is a meaningless time constraint. So I should be able to not only care for all of my current contracts but take on more as well. Ha, the fun of being Bipolar. Would you just shut up already? I have not worked out anything as of today. However, I am at least admitting that something, if not multiple things, will have to go. Recognizing a limitation is in itself a big step forward. 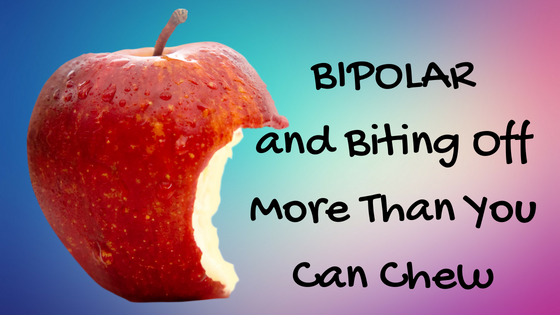 If you are not experienced with Bipolar, you should know that the Bipolar brain is seldom reasonable or modest. It tends to run in two black and white modes. Either it is absolutely sure that everything can be done or it is entirely hopeless with the fear that nothing can be done. Even proper medicines and appropriate self-care are not always enough to try to force the Bipolar brain to a point of compromise. For me, the best thing is usually to take a step back from everything. Now that the weather is finally nice, that might mean spending an entire day in the yard. When I’m feeling terrible, which has described far too many days lately, it usually means disconnecting from everything for a day or two. Many times that takes the shape of spending an entire day or two binge-watching something mindless on Hulu or Netflix. Sidenote, if you like science fiction and haven’t already watched it, Lost in Space on Netflix is well worth your time. That disconnect, though, is often enough for me to come back to whatever is overwhelming me with a fresh mind. Then I can look objectively at what needs to be changed and set about doing it. Putting this blog back into a priority position is one of those changes. One of the things that most excited me about starting a blog was the opportunity to share all of the things rattling around in my head. I read blogger advice about how you shouldn’t launch until you have at least 20 or more good post ideas in mind. I probably have hundreds. What I didn’t take into account, though, was that having a lot of ideas can be just as crippling as having none. The legal pad beside me is full of post ideas and opening lines or sentences. But when I try to sit down to develop one of these topics into a relevant and useful blog post, it’s like my mind becomes lost in quicksand. Moving forward is impossible. I am definitely open to suggestions, especially from those of you that understand Bipolar. How do I stop wandering in circles and get out of my own way so this blog can be all that I imagine it could be? No doubt, this lesson will come like so many others in my Bipolar journey. Through slips and falls and more than a few bumps and bruises, I will eventually find that path that works best for me. Until then, please bear with me as I work out all the kinks. Please share this post with others and on Pinterest. Thank you!